This is an expansion to the Settlers of Catan Game. You must have The Settlers of Catan board game in order to use this expansion set. Delve deep into Catan! In Catan: Traders & Barbarians, you'll find lots of cool new ways to explore Klaus Teuber's award-winning game series. You can now play with just 2 players! Add a harbormaster, a friendly robber, or special events. Play with a wealth of new wooden pieces and capabilities. - The Fishermen of Catan- Fish in the great lake or try casting in rich coastal shoals. A fresh, expanded, and updated version! - The Rivers of Catan- Not one, but two, great rivers invite flourishing commerce. Bridge them en route to glory and wealth. - The Caravans- Nomads of the oasis seek wool and grain. Camel caravans offer trade. - Barbarian Attack- Eager for booty, vile barbarians land and occupy Catan's fertile shores. Brave knights unite and ride to battle. 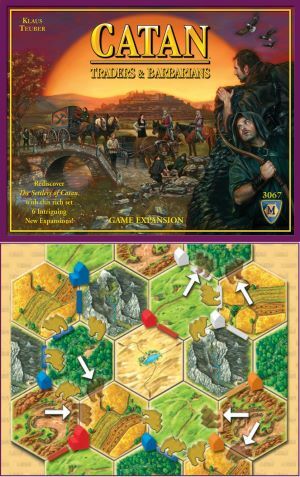 - Traders & Barbarians- Your wagons transport fine marble, glass, tools, and sand to help restore Catan's castle to splendor. Combine these rich scenarios to create a compelling campaign!